ناظریان, مرتضی, اکبری, سجاد, فرخ پیام, سعید رضا, نصرتی ششکل, بابک. (1395). تأثیر تیمار و نسبت پوسته بر روی خواص مکانیکی تخته خرده چوب ساخته شده از ذرات ساقه کلزا (Brassica napus). مجله صنایع چوب و کاغذ ایران, 7(2), 255-270. مرتضی ناظریان; سجاد اکبری; سعید رضا فرخ پیام; بابک نصرتی ششکل. "تأثیر تیمار و نسبت پوسته بر روی خواص مکانیکی تخته خرده چوب ساخته شده از ذرات ساقه کلزا (Brassica napus)". مجله صنایع چوب و کاغذ ایران, 7, 2, 1395, 255-270. ناظریان, مرتضی, اکبری, سجاد, فرخ پیام, سعید رضا, نصرتی ششکل, بابک. (1395). 'تأثیر تیمار و نسبت پوسته بر روی خواص مکانیکی تخته خرده چوب ساخته شده از ذرات ساقه کلزا (Brassica napus)', مجله صنایع چوب و کاغذ ایران, 7(2), pp. 255-270. ناظریان, مرتضی, اکبری, سجاد, فرخ پیام, سعید رضا, نصرتی ششکل, بابک. تأثیر تیمار و نسبت پوسته بر روی خواص مکانیکی تخته خرده چوب ساخته شده از ذرات ساقه کلزا (Brassica napus). مجله صنایع چوب و کاغذ ایران, 1395; 7(2): 255-270. در این پژوهش تأثیر ابعاد ذرات در لایه‌های سطحی و نسبت پوسته (نسبت ضخامت لایه سطحی به‌کل ضخامت تخته) بر روی خواص مکانیکی تخته‌خرده‌چوب سه لایه ساخته‌شده از ذرات تیمار شده کلزا بررسی شد. نسبت پوسته در سه سطح (mm16:mm 82/2، mm 16:mm 33/5 و mm 16:mm 6/8)، ابعاد ذرات استفاده‌شده در لایه سطحی در دو سطح (25/1> و 25/1<میلی‌متر) و نوع تیمار ذرات لایه‌های سطحی در سه سطح (بدون تیمار، آبشویی و اسید شویی) به‌عنوان متغیرهای مستقل انتخاب گردیدند. خواص مکانیکی تخته‌ها شامل مدول گسیختگی (MOR)، مدول الاستیسیته (MOE) و چسبندگی داخلی (IB) با استفاده از استاندارد EN آزمون گردید. نتایج نشان داد که استفاده از ذرات ساقه کلزا و با ابعاد 25/1< میلی‌متر در لایه‌های سطحی تخته‌خرده‌چوب سه لایه، به ترتیب سبب افزایش مدول الاستیسیته، مدول گسیختگی و چسبندگی داخلی گردید. علاوه بر آن، مشخص گردید که افزایش ابعاد ذرات در لایه سطحی و تیمار آبشویی باعث بهبود خواص مکانیکی نمونه‌ها شد. بر اساس نتایج، با استفاده از ذرات ساقه کلزا آبشویی شده بکار رفته در لایه میانی، مصرف ذرات با ابعاد 25/1< میلی‌متر در لایه سطحی تخته‌خرده‌چوب سه لایه با نسبت پوسته mm16: 82/2 و mm16: 33/5 می‌توان به مدول گسیختگی و مدول الاستیسیته مطلوب دست‌یافت. Rangavar, H., Bazyar, B. and Akbari, H., 2013. Study on the possibility of particle board tree-layer manufacturing using chick-pea (Cicer arietinum) stem. Iranian Journal of Wood and Paper Science Research, 28(2): 224-237. (In Persian). Miyamoto, K., Nemaha, S. and Suzuki, S., 2002. Effects of particle shape on linear expansion of particleboard. Journal of Wood Science, 48: 158-190. Hill, C., 2006. Wood Modification: Chemical, Thermal and Other process. John Wiley and Sons Ltd, Chichester, Sussex, UK. Ohlmeyer, M. and Lukowsky, D., 2004. Wood-basedpanels produced from thermal treated wood –Properties and perspectives. In: Wood-frame housingdurability and disaster issues conference. Oct. 4–6, Las Vegas, USA, pp. 127-131. European Standard EN 310., 1996. “Wood based panels, determination of modulus of elasticity in bending and bending strength,” European Standardization Committee, Brussell. European Standard EN 319., 1996. Wood based panels, determination of tensile strength perpendicular to plane of the board. European Standardization Committee, Brussell. Zhou, D., Zhang, L. and Guo, S., 2005. Mechanisms of lead biosorption on cellulose/chitin beads.Water Research, 39: 3755 –3762. Edoga, M.O., 2006. Comparative study of synthesis procedures for urea-formaldehyde resins (Part I). Leonardo Electronic Journal of Practices andTechnologies, 72: 607 –17. Coates, J., 2000. Interpretation of infrared spectra, a practical approach. In: Meyers R, editor. Encyclopedia of Analytical Chemistry. John Wiley and Sons, Chichester, Sussex, UK. Kumar, A., Gupta, A., Sharma, K.V. Nasir, M. and Ahamed Khan, T., 2013. Influence of activated charcoal as filler on the properties of wood composites. International Journal of Adhesion & Adhesives, 46: 34 –3. Colom, X., Carrasco, F., Pages, P. and Canavate, J., 2003. Effect of different treatments on the interface of HDPE/lingocelluloseic fiber composites. CompositesScienceandTechnology, 63: 161-169. Mottet, A.L., 1967.The particle geometry factor. In: Maloney T. (editor). Proceedings of the W.S.U. particleboard symposium, No. 1, Pullman, Washangton, USA. Bhagwat, S., 1971 .Physical and mechanical variations in cottonwood and hickory flakeboards made from flakes of three sizes. Forest Products Journal, 21: 101–3. Windeisen, E., Bächle, H., Zimmer, B. and Wegener, G., 2009. Relations between chemical changes and mechanical properties of thermally treated wood.Holzforschung, 63(6): 773-778. Wong E.D., Zhang, M., Han, G., Kawai, S. and Wang, Q., 2000. Formation of the density profile and its effects on the properties of fiberboard. Journal of Wood Science, 46(3): 202-209. Hatefnia, H., Enayati, A.A., DoostHoseini, K. and AzadFallah, M., 2012. Effect of steam treatment on chemical changes of wood components. 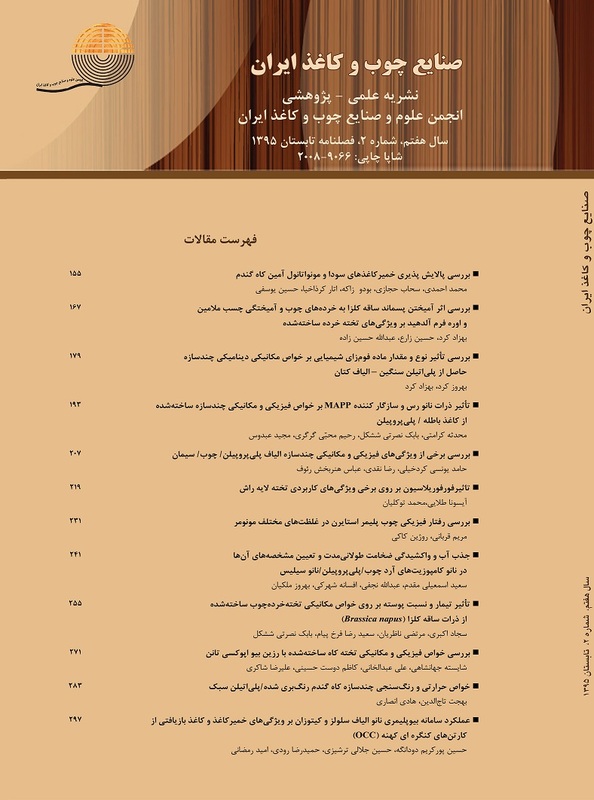 Iranian Journal of Wood and Paper Science Research, 26(4): 682-698. (In Persian). Rathke, J., Sinn, G., Konnerth, J. and Müller, U., 2012. Strain measurements within fiberboards. Part I: inhomogeneous strain distribution within medium density fiberboards (MDF) loaded perpendicularly to the plane of the board. Materials, 5: 1115-1124. Wong, E.D., 1999. Effects of density profile on the mechanical properties of particleboard and fiberboard. Wood Reserch, 86:19-33. Mohebby, B., Ilbeighi, F. and Kazemi-Najafi, S., 2008. Influence of hydrothermal modification of fibers on some physical and mechanical properties of medium density fiberboard (MDF). Holz als Roh – und Werkstoff, 66(3): 213-218. Pizzi, A., 1983. Wood Adhesives, Chemistry and Technology. Marcel Dekker Inc., New York.